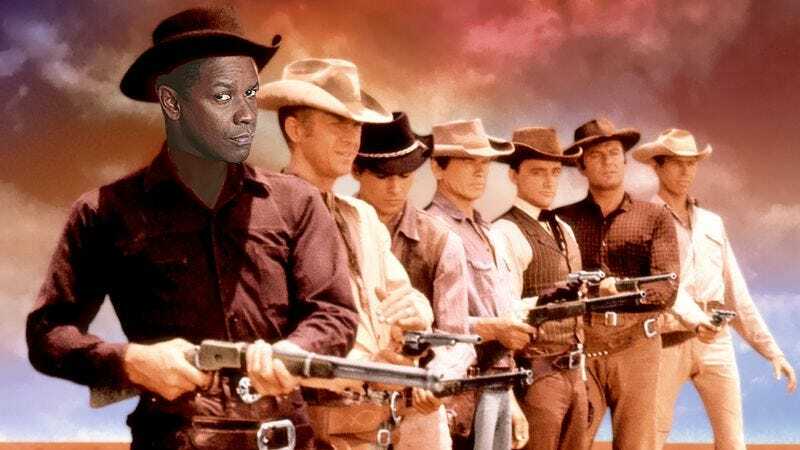 On a short break from Equalizing, director Antoine Fuqua and his muse Denzel Washington are looking to remake one of the best-loved Westerns ever made—John Sturges’ The Magnificent Seven. The original starred Yul Brynner, Steve McQueen, Charles Bronson, Robert Vaughn, and James Coburn as part of a team of gunslingers hired to protect a town from outlaws, just as the gunslinger era was coming to a close. The 1960 film is itself a retelling of Akira Kurosawa’s Seven Samurai, also considered an all-time classic film. So Fuqua has a lot to live up to. However, there’s a lot to suggest he’ll get it right. MGM has made the film a priority, after trying and failing to get it made with Tom Cruise in 2012. Fuqua directed Washington to an Oscar in Training Day, and Sony Pictures is so confident in their work together on The Equalizer, they’ve already ordered a sequel for the not-yet-released movie. With Washington on board, it shouldn’t be difficult to fill six other iconic roles with top talent. True Detective writer Nic Pizzolatto wrote a script when Cruise was still on board, and while the studio has hired The Blind Side scribe John Lee Hancock to rewrite it for Washington, that’s still a promising start. Just so long as they don’t call the thing Magnifi7ent, odds are good this remake could be more entertaining than sacrilegious.